MacGyver and Mercedes: a winning combination? will promote its new urban delivery van Citan. The Citan will make its debut on September 18, at the IAA Commercial Vehicle Show in Hanover, Germany. On the same day three webisodes will be released. The most interesting aspect of those webisodes is the main hero: MacGyver. Here’s the official website of the collaboration. MacGyver is a hero from the TV series of the same name that ran from 1985 to 1992. He was an unconventional hero: he didn’t use weapons, was afraid of heights, and was expert at making complicated machines out of ordinary things. MacGyver was played by American actor Richard Dean Anderson, who is now 62. Here’s the German version of the video. What do you think about the video? I’ve spent the next few minutes thinking whether I’d pair an old hero with my new car if I’d be a marketing manager at such company. Honestly, I would think again. However, I engaged in a conversation with Tobias Borris, a PR-assistant from Munich-based company Häberlein & Mauerer AG, who published the trailer on Twitter. Even though the last episode of MacGyver ran 20 years ago, his skills and stories are still known to pretty much everybody – even younger audiences. But of course he’s especially an icon and superstar to the elder generation that’s now 45-60 years old. Today they work as carpenters, painters or mechanics and rely on a high-quality van to fulfill their work on a daily basis. This connection makes Richard Dean Anderson (aka MacGyver) the perfect endorser and content format for Mercedes-Benz vans that are designed to fit the needs of exactly those people. 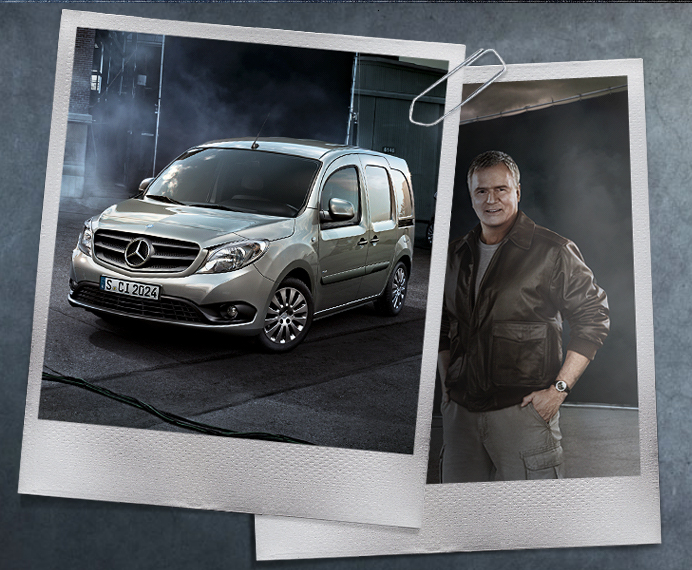 To promote the launch of the Citan, Mercedes’ new city van, the ad agency Lukas Lindemann Rosinski developed an integrated campaign around MacGyver and the Citan. The story: MacGyver retired from his job at the agency. He opened up a small craftsman’s business to make a living without any trouble. But of course it doesn’t work out that way for MacGyver and by accident he’s getting caught in crossfire between good and evil. The videos come along with a print campaign, as well as with TV and cinema commercials. The episodes will be featured on YouTube. Surely YouTube is the most common video platform in Germany (OTT-providers like HULU, Netflix, etc. are not available in Germany, yet) but other experts might argue that it simply doesn’t fit the needs of 45-60 year old, hard-working people. When they come home after a hard day at work they probably tend to turn on the TV instead of YouTube. Even though YouTube claims that basically every target group is using their service, their core user group clearly are tech-savvy and outgoing men between 18 and 24. These are certainly not the people who even consider buying a city van. The campaign might have more impact if they produced it in cooperation with a popular TV channel and screen the first episode on prime time TV. Commercials could raise awareness of the micro site and announce that further episodes are available on the Mercedes-Benz website only. An action hero like MacGyver, who only needs a duct tape and Swiss Army knife, is certainly better equipped if he has a car, but I agree with Tobias: the content might work, but the channel may not be optimal.